If you’ve looked for hiking footwear recently, no doubt you’ve noticed a dizzying array of options. Here’s a quick guide to finding the right shoe for your foot in five easy steps. Which shoe type fits your terrain and hiking style? Trail Runner – Heavier than a road running shoe, but still can be light weight. They are designed to support and protect the foot on rugged trails. Light Hiker – Made for hiking on well-established trails, they are not meant for extremely rocky, rugged or off trail hiking. 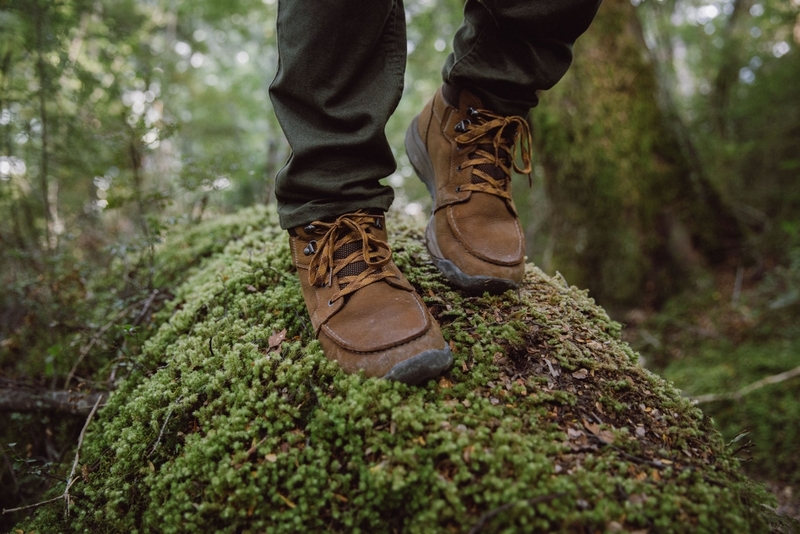 Mid Hiker – These are sturdier than the light hikers, usually with deeper lugs for increased traction. Heavy Hiker – Sturdy, usually boots that are higher cut and will protect the ankle and foot. A shoe is typically lighter in weight, more flexible and cooler than a boot. Shoes will mold to your foot faster and are often more comfortable out of the box. But they will usually wear out faster than a boot. A boot is usually thicker than a shoe and is heavier. Boots will help support the weight of a pack and often feature more dense midsole construction. A boot will usually offers more protection for your ankle. For shorter summer hikes, non-waterproof shoes will offer more breathability. They are also often more budget friendly and lighter in weight. Waterproof shoes provide valuable protection from the elements on rainy days, stream crossings, and winter hikes. Waterproof shoes do not breathe as well as non-waterproof, and can trap moisture both directions. If you tend to have sweaty feet, keep this in mind. Waterproof shoes are typically a little more expensive than non-waterproof. No guess work – an in store fitting is the best way to get shoes that work well for you. Our staff is always happy to measure your feet. It is very important to try on both shoes. Most people have one foot that is longer than the other and you want to make sure you have a proper fitting for both feet. Wear the correct sock when trying on hiking shoes. Make sure they are the same thickness as what you will be hiking in. A medium thickness is typically recommended. No cotton socks – they will give you blisters! Check to see if your foot slides when going down hill or your heel is slipping when going up hill. We have a special knot to fix that. Shoe size varies from company to company, don’t be surprised if you wear different sizes in different shoes. Some shoes are more narrow, while others can be a little wider. One of our shoe experts can recommend styles that will work well for you. Take ’em for a test ride. 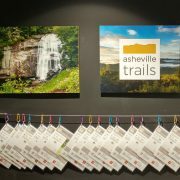 While a proper fitting will get you most of the way to a perfect fit, some issues may not be noticeable on a 10 minute jaunt around the store. Wear your new shoes around inside the house prior to taking them on the trail. I recommend wearing them while vacuuming or doing chores to get a feel for what they will be like during extended wear.